For the majority of the 20,877 capacity, views of the Vicarage Road pitch are good with no obstructions. Away fans are housed in the Vicarage Road stand behind one of the goals. Both this build and the Rookery stand opposite are single tiered and have fantastic views of the action. The rookery is where the most vociferous fans tend to sit along with a very loud drummer. 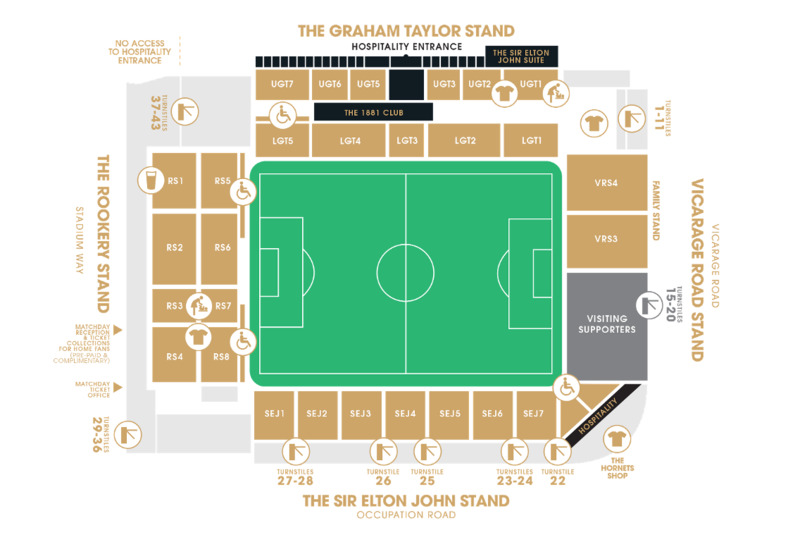 The Graham Taylor stand is two tiered and runs parallel to the Sir Elton John stand which opened late 2014 and is a single tiered, all seated affair. The Graham Taylor stand has very impressive views and like the other 3 stands, is pillar free. Visiting supporters are situated in the Vicarage Road end of the ground and in the left hand side of the stand. The cantilever stand means there's no supporting pillars and as such the view of the pitch from here is really good. There are ample catering facilities in the away end but queues are inevitable depending on the size of the crowd. It is the usual football fare of pies, and hot and cold drinks, beer is available, and can be drunk on the concourse. Prices are more expensive than outside outlets and as a rule people tend to get refreshments outside the ground before the game. There are a number of pubs in the town centre, which can be used by visiting fans. The Hogs Head on the high street has plenty of space and offers reasonably-priced beer. The Moon Under Water (a Wetherspoons pub) in the high street has some of the cheapest drinks (and food prices) in the town, served in a fairly relaxed atmosphere. It also allows children in if they are eating. Restaurant-wise, there is a great selection of eating places around town but rather than list them all, have a look around the High Street or you could try the food court at the Harlequin Centre, only five minutes on foot from the ground. Up by the ground, there is a chip shop and café to be found in Vicarage Road, about a two-minute walk from the turnstiles. Parking is easiest at Vicarage Road girls school situated very close to the stadium. It costs £5 per vehicle and considering the locality of the ground is the best and easiest to park in. Being so close to the town centre, it's not a bad idea to park in one of the towns car parks and walk in. Many fans do this but it can be very busy getting away after the game. The nearest / closest train station to Watford's Vicarage Road Stadium is Watford High Street which is around 10 minutes on foot from the ground. It is served by trains on the London Euston – Watford Junction line. From London, the journey takes around half an hour and costs around £6.40 single. Watford Junction is only 3 minutes by train from Watford High Street. You can walk to the ground from the station but it will take around 20 minutes. If you do want to make the journey on foot, take Clarendon Road opposite the station entrance as far as the High Street, crossing over the Ring Road. Turn left, walking past the Moon on the Water Wetherspoons taking the first road on your right (Market Street) after 100 yards. When you come to a T junction, take a left and the ground is the next on your right. Watford tube station lies at the northern end of the Metropolitan line, around a mile on foot from the ground. The journey by tube takes longer than by overland train so it's advisable to use that where possible. We don't currently have any fans reviews from Watford's Vicarage Road. To tell us about your experiences and to feature on the site, simply complete the fans review form below!